This guide explains how to receive a Contact ID alert notification using Ozeki VoIP SIP SDK. This way, you can be notified in case of any alarm that allows you to monitor your whole alarm system. After reading through the following guide, you will find out how to use your own C# application for this purpose. To use this example, you need to have an Ozeki VoIP SIP SDK installed, and a reference to ozeki.dll should be added to your visual studio project. It is also recommended to visit the How to register to a SIP PBX and How to accept incoming call with Ozeki VoIP SIP SDK using C#? articles before studying this functionality. The Ademco Contact ID protocol is the most popular protocol that is used for communication between the alarm systems and the Central Station. If you would like to implement any alarm functionality, you will need to use this protocol. You can find a detailed guide about this protocol at the Contact ID protocol page. You can also check its official documentation that can be found at the Contact ID standards page. It describes how this protocol works. 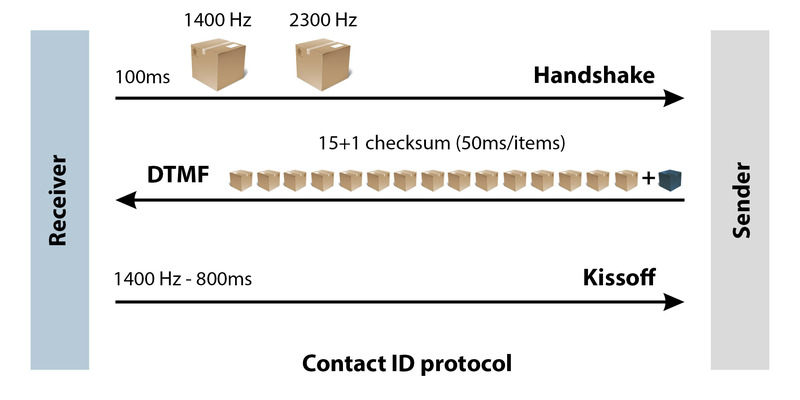 Figure 2 illustrates the participants of the communication. The alarm systems can be connected to some kind of ATA devices (e.g. Linksys SPA3102). By using this device the Contact ID alarm message can be sent through the VoIP network for the dialed telephone number, if the receiver side is ready to accept the Contact ID (that is, the use of the protocol). The following example program allows you to receive these alerts. How to implement a Contact ID alarm receiver using C#? During the communication with the Contact ID protocol, the DTMF frequencies may be distorted if you do not use a codec applying lossless compression. So you need to use PCMA or PCMU codecs. This setting can be seen in lines 28-32. To implement the receiver side it is required to be able to accept a call. In connection with this task, you can find more information at the Accept incoming call page. In addition, you need a ContactIdHandler type object as well that needs to be signed up to the ReceivedNotification event. When this event occurs, it means that a Contact ID alarm is received. In order to ensure that the receiver works properly, the contactIdHandler object should be connected to the phoneCallAudioSender and phoneCallAudioReceiver objects when the call is established. This ensures that both of the incoming and outgoing communication will be carried out through the contactIdHandler. After that, you need to run the contactIdHandler, so you need to call the Start() method.